Wooden dog kennels are a great option for those looking for a place for your dog to stay when you are out for the day or for the night when there are guests over. Why would you purchase a wire dog kennel? They look horrible and it makes your dog look like it is in a prison for hamsters. Not only that, the wire dog kennels tend to be built more cheaply. 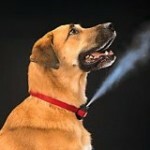 There are multiple options for you on the internet that will fit dogs of a variety of sizes. Mr. Herzher’s Pet Residence is a dog kennel that your dogs will like but will also look appealing to humans. The crate is built mostly out of wicker with small metal windows on both sides and a metal front door. The crate comes in four different sizes from small to extra-large. The small is 24 inches long by 18 inches wide and 21 inches tall while the extra-large is 42 inches long by 28 inches wide and 31 inches tall. A bottom pan slides into the bottom of the crate making it extremely easy to clean if your dog has an accident or sheds. 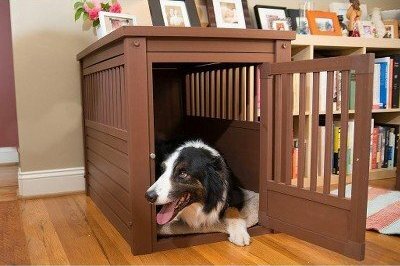 Amazon offers this wooden dog kennel that can also act as an end table. The top, bottom, and corner posts are built out of wood. The sides of this wooden dog kennel are made out of a metal wire. 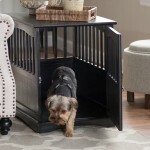 It features two different dog doors and comes with a middle divider in case you want to keep two dogs in it. 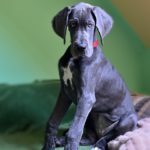 It comes in three different sizes with the small and large being about equivalent to the small and extra-large Pet Residence mentioned above. Also like the pet residence, the Merry Products Crate ‘n Cage offers a tray on the bottom that can be pulled out to clean up after your dog. 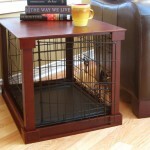 If you are looking for a wooden dog kennel then this New Age pet crate is a great option for you. It can be found on anywhere and is available in two sizes, a small and a medium. The small size is 20.9 inches by 15 inches and a total of 17.9 inches tall on the inside. 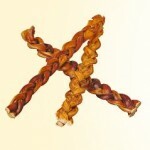 The medium size is 26.9 inches by 21.1 inches and 20.9 inches tall. Unlike the others this wooden dog kennel is made almost entirely of wood. It features small slats that prevent your dog from reaching out and unlatching the door and from sticking its snout out and licking/chewing on anything. The color of this crate is listed as russet, a light brown color. All of these are options for wooden dog crates. While some of them do incorporate wire for the sides or doors they aren’t built completely out of wire and therefor don’t look like small prison cells. Make sure that you measure the location you wish to put your wooden dog kennel and make sure the kennel you order is big enough for your dog.